We have made great steps toward eliminating poverty around the world—extreme poverty has declined significantly and seems on track to continue to do so in the next decades. Jim Yong Kim of the World Bank estimates that extreme poverty can be eliminated in 17 years. This is clearly cause for celebration. However, this good news can make us oblivious to the fact that there are, in the United States, a significant and growing number of families who live on less than $2.00 per person, per day. That figure, the World Bank measure of poverty, is hard to imagine in this country—most of us spend more than that before we get to work or school in the morning. In $2.00 A Day: Living on Almost Nothing in America, Kathryn Edin and Luke Schaefer introduce us to people like Jessica Compton, who survives by donating plasma as often as ten times a month and spends hours with her young children in the public library so she can get access to an internet connection for job-hunting; and like Modonna Harris who lost the cashier's job she had held for years, for the sake of $7.00 misplaced at the end of the day. They are the would-be working class, with hundreds of job applications submitted in recent months and thousands of work hours logged in past years. Twenty years after William Julius Wilson's When Work Disappears, it's still all about the work. 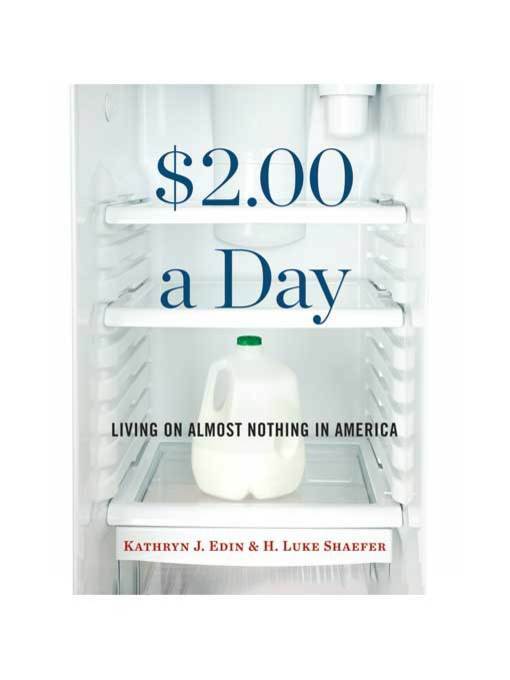 But as Edin and Shaefer illuminate through incisive analysis and indelible human story, the combination of a government safety net built on the ability to work and a low-wage labor market increasingly designed not to deliver a living wage has delivered a vicious one-two punch to the would-be working poor. More than a powerful expose of a troubling trend, $2.00 a Day delivers new evidence and new ideas to our central national debate on work, income inequality, and what to do about it.